AM8060 Precision Thermometer provides high accuracy, fast readings and great stability. It comes with dual channel measurement of temperature with Platinum Resistance Thermometers (PRTs). The temperature of each input and their temperature difference are displayed simultaneously. All of the readings can be stored in a USB flash disk or transferred to PC through a wireless module or an USB cable. 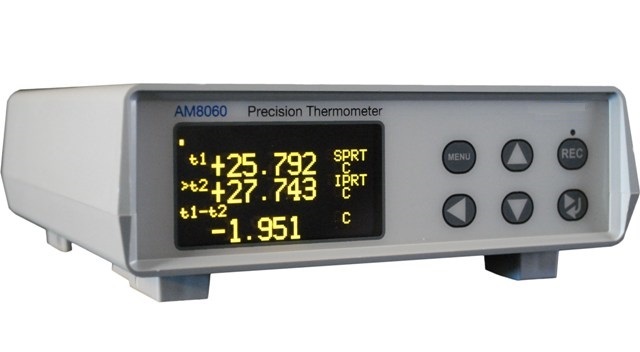 AM8060 Precision Thermometer allows users to choose ITS-90, IEC-751 (DIN), or Callendar-Van Dusen conversion methods to response to various PRTs. Users can also choose to key in calibration data of each PRT to ensure the best accuracy. This dual-channel readout is a perfect choice for precision temperature measurement and calibration. It’s also a top choice as temperature reference for Drywell Calibrators and Temperature Bath.